Problem of every blog is that all posts disappear in archive after while and they cannot return back to the front page unless the author changes the publishing date. That’s a cheap trick and we don’t like cheap tricks, right? So I’ve created Archivist – plugin (for WordPress) that does this job in a nice way. Copy archivist.php file to your wp-content/plugins directory and activate it. 'number_of_posts' – number of posts from the archive that should be shown on the front page. 'random' – these posts can be selected randomly or sorted by date. 'from_categories' – it's possible to limit the categories where the post(s) are selected from. Just insert the list of category IDs. 'older_than' – defined in days. E.g. 60. 'newer_than' – defined in days. 'title' – defines how should be changed the title of selected post(s). 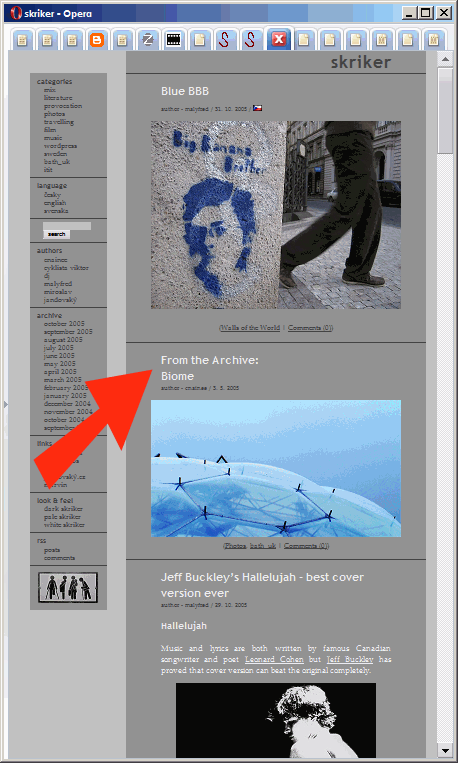 There is added "From the archive: " before the title of each post by default. – An option to keep an archived post on the front page for the lenght of a day or certain time frame. This would allow visitors within a certain frame to view the same post from the past & possibly incite commentary. Moe> That was my original idea for this plugin but I haven’t thought out any useful mathematical formula that would allow me to pick one RANDOM post from the archive and keep this random selection the same for the whole day. Solution would be to save the selection to the database or to the file or something like that but that’s not acceptable for me. If you don’t insist on the random selection you can achieve this behaviour when you set the ‘random’ parameter to ‘false’. a wunderful script, thanks for it! I would like the random post from the archive (made with this plugin) to be styled differently with CSS. For example with a different background to make it stand out, and maybe an icon or something to signal “from the archives”. I’m getting some errors when logging in/out to wordpress admin when the Archivist plugin is activated. when already logged in it’s okay. I like the plug in unfortunately i have to keep deleting it if i log out of wordpress. Neuville:: oh, that was a bug. Download the version 0.4 and set the number of posts per page to 2. Because you actually want to show 2 posts per page, the “right one” and the random one, right? p.s. Is there a way to build a sort of random posts panel, where random items are smaller than the main post, and users can choose to view an item by clicking it? it does it on at least 2 sites i run wordpress on, i did the upgrade as suggested and deactivated all plugins before upgrade. i’ll set up a test install on my 1&1.co.uk server and see what happens. no. post 1, random=false, frontpage pos. 1, from cat. 8, older than -1, newer than 7. And I have a test post newer than 7 days, in cat X. Any idea why it does not show my test post? Am I the only experiencing this problem? blau:: There is an additional condition hardcoded in the plugin that selects only post older than the oldest post on the front page (to avoid having the same post twice on the page). Regarding post #14: I can’t find “$draft->post_title = str_re….” anywhere? Not in index.php, not in the archivist.php file… Where is it? I’ve only just switched to WordPress 2.0, a brand-new installation and this is one of my first plugins. I really like it but I have to switch it off whenever I want to edit an old post, same problems that Paul Roberts reports above. Clearly, there’s something going wrong and it’s a great shame. I hope it can be resolved soon. i really love the idea of archivist.. but it wont work like i want it to do. if i chose a category, it displays nothing on the front page. i really would be thankful for your help! sternenlicht:: What about comment #18? 0.5 seems to be conflicting with the WP polls plugin I get a header error when i try to vote on a poll with archivist activated. Otherwise it is a cool plugin. Sorry had to deactivate because of the error. I would like the random post from the archive (made with this plugin) to be in a sidebar. jonnie:: No, but I think there are other plugins that could do that. Kjempe kuuuul hjemmeside du har. Great plugin as are all of your others that I use! 1. I am curious if there would be an easy way to display an archive post every 3 posts or every other not jsut one instance. I have a long list of short posts on the front page and want to have multiple instances of archived posts be inserted. 2. Can this plugin be moded to also insert archived posts into a category page, where the archive posts are from a different category. Clark:: both things are possible even if you have just tiny knowledge of PHP. Good luck at the uni! I’ll see what I can hack out. Thanks for all of the great work!!! What do you consider the “Front Page” I installed this plugin and nothing happens. I’m in love! Totally and completely. I’ve been looking for something like this for over a year, getting totally stuck with the random and specific category queries. This is a dream. It worked first time out with WordPress 2+. Excellent. Couple of things. I’d like the ability to move the archive post feature to the top of the posts on the front page, not just in second place. Any ideas on that? Also, why isn’t this in the WordPress Codex Plugin List or wp-plugins.net? I’ve been hunting. Get this in there so others can find it. It’s a “featured post” WordPress Plugin, so make sure those words are in the description to help others find it. I will be featuring it on my blog soon, so hope your server is up to it. Lorelle:: Archivist is in the “Randomness” section of the Codex. Feel free to add it to other categories or change the description – Codex is open for everybody. My english is not very good so I have problems to find the proper descriptions quite often. To place the “featured post” (you see – I’m learning fast:) to the top of the page – just set ‘frontpage_position’ to 0. That should work. Excellent. I searched the Codex and didn’t find it, but I’ll make sure that it gets put in the right place now that I know. Thanks. And you make sure it is listed in the wp-plugins.net database, as that is where people do their real plugins hunt. Only plugin authors can submit and your English is beautiful! I find your plugin to be exactly the sort of thing I’m looking for. Unfortunately, I can’t use it at the moment because there’s a slight bug which occurs: it creates a ‘From the Archive: …’ post below the newest post which is fine, but then beneath that it shows the newest post and another ‘From the Archive: …’ post again. I’m using version 0.5 of your plugin with the default settings I think. How can I get rid of this repetition? Michael:: No, this cannot happen, because there is an additional rule applied, that selected post must be older than the oldest post on the page. The English Nomad:: This sounds like some kind of collision with other wp plugin. Good. Thanks for this really great plugin! Oh my, it’s me again: How can I exclude a specific category of being shown in the “from the archives”-article. I know that I can define specific categories to be shown, but my question is the other way round: how to exclude specific categories. This would specifically usefull, because I do not want my daily links or sponsored posts to be shown again after they went into the archives. Is there any way to keep the ‘removed post’ when one uses the ‘keep_the_limit_of_posts_per_page’ option? Apart from this little glitch, I am totally in love with this plugin. wonderful plugin. I have been using it for a few weeks before I discovered that the post and the post listed in recent post sidebar are different. I have reloaded the file to get default settings back. no change. Wow — what a great plugin — one-click install, easy customization, works just as advertised. Thank you! @vijay – If you still want only 10 posts showing on your front page, just keep the extra post that comes with the plug in and change the number of posts shown (set in the options page) to 9. I too have to switch the plugin off to add posts and turn it on again afterwards. Any workaround? I will be promoting your Plugin again in the next week or so, and I wanted to know how to set it to do excerpts instead of the full post. I will also be testing this in WordPress 2.1. Have you? I have my “archives” on a seperate page. Is there any way to for this plug-in to make the random entry appear on that page? Can I set Archivist to show one selected post, not only a selected category? I’ve activated the plugin but nothing happens on front-end. Must I do something else? Maybe to include the php page into other pages? Thanks, this is a great plugin! I’m sorry to everyone here that Malyfred isn’t responding. I know that English isn’t the native language here, but if you want some limited help, I’ve written extensively about this fabulous WordPress Plugin at Revitalizing Your Blog’s Past Posts – The Archivist WordPress Plugin. I hope that helps answer some of your questions. Hi! Thanks for this plug-in, but I don’t get it. It doesn’t seem to work on my site. What am I doing wrong? @bo What version of WP do you use? Probably some old one, no? @Lorelle Thank you. Any help is a appreciated. Thank you SO much! This is EXACTLY what I was looking for.. beautiful!! Got it pretty much doing all the things the way I want them to but have just one question; how can I tell it to ignore “pages” (and just include “posts”)? I considered using the ‘from_categories’ rule but I don’t think I can assign categories to pages so that doesn’t seem useful for this exclude. Appreciate any advice! @jon There must be something wrong with your WP in general because the Archivist simply cannot retrieve the same post twice from the DB in one query. How old is your WP installation? What version of WP do you use now? @jon Could you give me a link to see it in action? Great idea! Very useful plugin. Wonderful Plugin. Thanks a lot to the autor! As already in #59 stated, I, too, have the problem that it displays pages as well. Part2: … however, the modification leads but to an error-message. Would be nice to get a hint how I can manage that problem. THANKS a lot. Love your plugin. Works great in my WP2.3 theme. Is there a way to use a php call like — code — php get_archivist_post — endcode — or some other method to place a single random post somewhere on the page other than directly above or below the regular posts? I am trying to find a way to place a single random post in a div that runs across the bottom of the page. I use Archivist since Version 0.5 and love it. Upgraded to WordPress 2.3.1 and it still works, although there are different archive posts shown in the content pane and in the recent posts widget output. I m trying to have this plugin on my site, but its somehow not working. I uploaded the plugin, and activated, and changed the settings according to my needs ( as per instructions above) , but still, nothing happens on the main page. do I need to add something to my index page ? I m sorry if this is really stupid question, but I m not that much IT literate person. Please help. How can I modify Archivist so that it replaces my last post (most current post) on my main page if the current post is older than 3 day. Basically what I want to do is as the post stagnates start rotating through Archive posts but as long as the post is current keep that one on the main page. I couldn’t find a way to do it unless I missed something somewhere. Do you have any idea if there’s something similar for Blogger? Are you planning on updating this for WP 2.5? Greatly need something like this! Great plug in, would love to see it upgraded to 2.5! When I clicked on “automatic upgrading” under the “Archivist” plugin, the plugin get updated with ImageGallery plugin instead and the Archivist disappeared. Even the link on my plugin list goes to your ImageGallery plugin page on WordPress. I fixed the problem by installing again the Archivist plugin and it works fine but the update message appears again and leads to ImageGallery. Hope you can fix this. Thanks for great plugin. great plugin, i love it! Hi! I’m still using wordpress 2.3.3 and the archivist seems only compatible with wp2.5 and higher. Where can I find older versions of the plugin that are compatible with wp2.3? Awesome plugin/wordpress trick. I am going to incorporate this into my blog. As those who really need it, in my signature there is some interesting information about [url=http://newmoviereleasesdvd.info/]Watch Movies Online Free[/url].